When Apple unveiled its iPhone software development kit at a March media event, the company ushered five developers on stage to demonstrate what they had been able to do with just limited exposure to the tools for creating native apps for the iPhone. Turns out, that series of demos in March was just an opening act for the main event at this week’s Worldwide Developers Conference. During the Monday keynote kicking off the week-long developer confab, Apple CEO Steve Jobs yielded the floor for 33 minutes—a little less than a third of the keynote’s runtime—so that a steady parade of developers could tout their wares in anticipation of the early July release of the iPhone 2.0 software (which will add the ability to add third-party programs via the included App Store). In all, 11 developers took the stage Monday for their two-to-three minutes of fame, giving the Mac universe a sneak peak of what kind of applications await iPhone users. If you missed our keynote coverage—and really, how dare you—or if you don’t care to sit through Apple’s QuickTime showing of the keynote, here’s a sampling of the applications coming soon to an iPhone near you. You can also get a flavor for the apps on display, courtesy of an IDG News Service video embedded below. The only repeat performance from the March SDK event demos, Sega again showed off its iPhone game, Super Monkey Ball. But this was no summer rerun—if the March demo was intended to show what developers could do after a few weeks with the SDK, Sega provided an example of what a couple months’ worth of development work can produce. Super Monkey Ball now features 110 stages and takes advantage of the iPhone’s tilt control. Sega expects to release the game once the App Store arrives in early July. Super Monkey Ball will cost $10. Devotees of the online auction service have even more incentive to shell out $199 for the 8GB iPhone 3G. eBay created an auction notification software that lets users know when they’ve been outbid on item and allows them to enter bids of their own. The app, built in roughly five weeks, displays a picture of the item plus a description. It includes a summary of your eBay activity plus a personal avatar. eBay’s iPhone app is slate for release alongside the App Store; you can add it to your iPhone for free. The location-based social network service has built an app for the iPhone that, in essence, lets you see where your friends are and what they’re doing. The Loopt apps superimposes friends on a map and lets you look at any photos they’ve taken or comment on their status feeds. It will also be free when the App Store launches. With TypePad’s iPhone app, you can post blog entries directly from your phone. 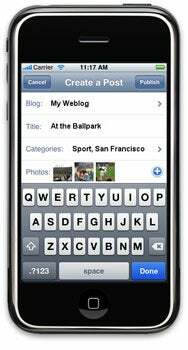 The creators of the blogging software have created a native blogging app for writing and posting weblog entries directly from your iPhone. Among the features showcased Monday are the ability to create posts or send photos taken with the iPhone’s built-in camera directly to your blog. There’s a pending items view that shows the progress of posts while letting you jump to view weblog posts via the built-in Safari browser. TypePad plans to introduce its free iPhone app when the App Store debuts. The news organization, which already offers a Web-based application also plans to go the native route with its Mobile News Network program. Adding locations provides you with local news while the iPhone’s Core Location feature can tailor the news to wherever you happen to be. The AP’s native app downloads the news as you read it. That allows you to access it later, even when you’re not connected to a network (or connected to a very slow one). Like many other iPhone apps demonstrated Monday, the AP offering ships for free when the App Store arrives. The long-time Mac game developer showcased two offerings—Enigmo and Cro-Mag Rally. 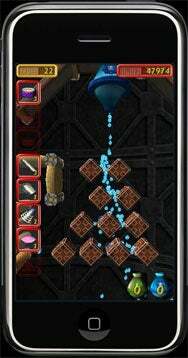 The former is a physics-based 3-D puzzle game that exploits the iPhone’s MultiTouch interface—you move and rotate various pieces to control streams of flowing liquid around a puzzle. Cro-Mag Rally is a more graphics-intensive 3-D racing game. It relies on the iPhone’s tilt controls to handle things like steering. Pangea plans to sell both games for $9.99 when the App Store launches. This is a one-man operation, where an insurance worker in England whipped up an app that lets you play various virtual instruments. (The video above shows an iPhone playing 12-bar blues.) You can fix different instruments together, forming your own band. It’s hard not think of this app—dubbed Band, appropriately enough—as a sort of mobile version of the Magic GarageBand feature from Apple’s own music composition program. Band is slated to appear on the App Store in “a few weeks time,” according to its developer. There was no word on pricing during Monday’s demo. MLB.com’s At Bat application—available via the App Store at launch—shows live scores, including information about who’s at bat and who’s on base. That’s useful enough, but the application also offers real-time video highlights from games in progress. MLB.com's Jeremy Schoenherr said the app includes "some features we're not offering anywhere else." We got a bird’s eye view of MLB.com’s At Bat application during our brief time with the iPhone 3G. My colleague Jason Snell had a chance to play around with At Bat during his hands-on time with the iPhone 3G Monday and came away impressed. He called it a definite improvement over a similar Web-based highlights app offered at AT&T Park, which is just down the street from the Macworld offices in San Francisco. Modality demonstrated one of the two medical applications shown Monday—expect many more from the medical field as the App Store establishes itself. Modality’s offering is a reference tool for medical students. A sort of mobile flash card, the app lets users zoom and pan across images of body parts. There’s also a pop quiz feature. Modality plans to have dozens of applications available through the App Store shortly after launch. Expect that figure to grow by year’s end. 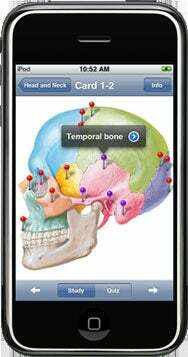 MIMVista plans on bringing its skill with medical imaging software to the iPhone. The demo during Monday’s keynote showed off the ability to merge a CT scan with a PET scan, while switching the orientation of the resulting image. MIMVista also is exploiting the MultiTouch interface, allowing users to draw lines on the image with a finger stroke and erase any drawings by shaking the phone. MIMVista plans to launch its application at the same time as the App Store. The developer parade began with a game, so why not end with one, too. In this case, the game was Kroll and the developer is the Barcelona-based Digital Legends Entertainment. From the graphics on display Monday, it’s clear game developers see the iPhone not just as a smartphone but as a mobile device capable of playing some pretty sophisticated offerings. Kroll, described by its developer as an action-adventure fantasy game, is slated for a September release. So what did we learn from all this? Other than the fact that iPhone apps apparently either cost $9.99 or nothing at all? For one thing, the rapidity with which some developers were able to assemble ready-to-demo native apps suggests that Apple has put together a pretty thorough SDK. More important, we got a sense of what kind of apps work best on Apple’s mobile device—games, notification apps, and other things that don’t require a lot of battery-draining background processes. We’ll find out just how many developers heed those lessons as we get closer to the App Store launch date. And if you’re a developer with an interesting iPhone application to share, we’d love to hear more from you. Just drop us an e-mail explaining what it is you’ve cooked up, and we’ll look into profiling it in this very space.